The opening of the UN General Assembly in New York provides advocates of human rights an additional forum to embarrass President Ahmadinejad of Iran for his serial violations of the rights of Iranians at home and abroad. A hunger strike by 36 Iranian dissidents, taken hostage by Iraqi forces, continues into its second month. 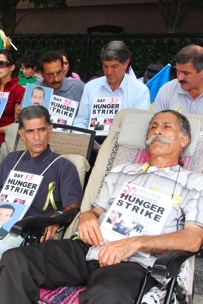 Hundreds of hunger strikes continue by Iranian exiles in Washington, London, Ottawa, Berlin, The Hague, and Stockholm; an area near the UN could become a site of a hunger strike. Meanwhile, over a hundred strikers have been taken to hospitals worldwide. As part of a book I am writing on Iran, I conducted interviews with Iranian dissidents, including hunger strikers in the area of the White House. Such interviews provide a glimpse of the nature of the protesters; what they seek and how their actions fit with the literature of social protest; and how sacrifice affects the policymaking process. Among the many hunger strikers, I selected six who looked the most exhausted in the hot sun and high humidity of Washington. They were mainly entrepreneurs, U.S. citizens, fiercely pro-American, and gravely disappointed and puzzled that President Obama had neither responded to their presence nor to the plight of their colleagues. All had strongly supported presidential candidate Obama assuming that his call for “change” would mean recognition of their status as the main Iranian opposition group to counter the Iranian regime; protection of their hunger-striking counterparts who had been kidnapped in Iraq by Iraqi Security Forces acting on behalf of Tehran; and continuation of the “protected persons” status of the Iranian dissidents by U.S. military forces in Iraq or at least replacement of American forces with an international force. I was on my way to Disney World with my two grandchildren when I heard the news of the Iraqi attacks against our unarmed Iranian relatives in Iraq. I made it only to South Carolina and immediately returned to Washington to become a hunger striker. My sister is among those Iranians who were attacked in Iraqi forces. Just as our Iranian brothers and sisters sacrifice their bodies in Iraq, so too we shall sacrifice our bodies to protect theirs in Iraq. Mehran Ebrahimi hit the nail on its head in his motivation to inflict suffering on himself to highlight a cause. When individuals impose such suffering, it is an act of supreme sacrifice and political protest to bring attention to their cause. Hunger strikers understand their message must get on the radar screen of the media to have any effect on policy makers. Indeed, partly as a result of the Iraqi assaults and hunger strikes in Iraq as well as at the White House, there has been increased media attention, e.g., by Mohammed Hussein of The New York Times; editorial page editors of The New York Times; Lara Logan of CBS Television and Mark Knoller of CBS Network Radio; and by Robert McCartney of the Washington Post. With the opening of the UN, there is an additional forum for communicating self-sacrifice. Hunger strikes are weapons of the weak to communicate injustice to the strong. By passively inflicting self-damage, Iranian dissidents reinforce the effects of active forms of protest, such as demonstrations near the United Nations. While the UN ponders, Iranian dissidents turn up the heat by signaling willingness to suffer. Suffering can become a source of influence by educating the international community to a cause about which they know little, signaling a sense of injustice to those informed of the facts but unconcerned with the issue of justice, and winning the attention of bystanders who may be recruited to help. At issue is whether enhanced attention is likely to change UN policy of not interfering with the Government of Iraq’s responsibility for the fate of Iranian dissidents who had been protected by the American military. U.S. protection lapsed with the Status of Forces Agreement of January 2009 and withdrawal of Americans from urban areas; meanwhile, the UN has not assumed any such responsibilities. But now that the Iraq Security Forces attack unarmed Iranian dissidents rather than protect them, the international community is deliberating how to handle this new situation. Dispersal of the Iranian dissidents within Iraq, repatriation to Iran, and a post-American UN force to provide protection are three prominent options. Without the hunger strikes, it is unlikely that the United States will even contemplate meeting its international legal obligations to ensure Iranian dissidents are not dispersed within Iraq, where they likely would be kidnapped and taken to Iran; repatriated to Iran, where they are likely to be tortured or executed; or attacked again. Such alternatives can only be avoided if there is post-American UN force to provide protection. As the UN General Assembly opens, now is the time to consider the relevance of an international force to protect Iranian dissidents in Iraq against attacks on them, inspired by Tehran.